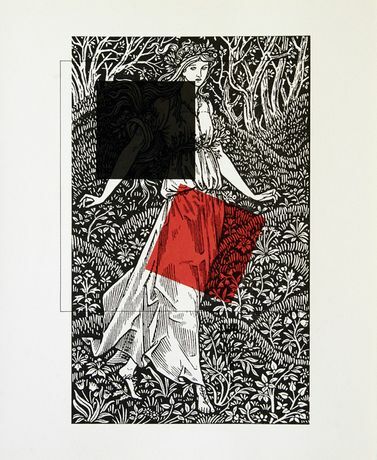 Transformations of William Morris' and El Lissitzky's utopian books, 'The Wood Beyond the World' and 'About Two Squares'. Handel Street Projects is pleased to announce About Two Worlds, an exhibition of new works by British artist David Mabb. In this new exhibition, Mabb presents a work in two parts. 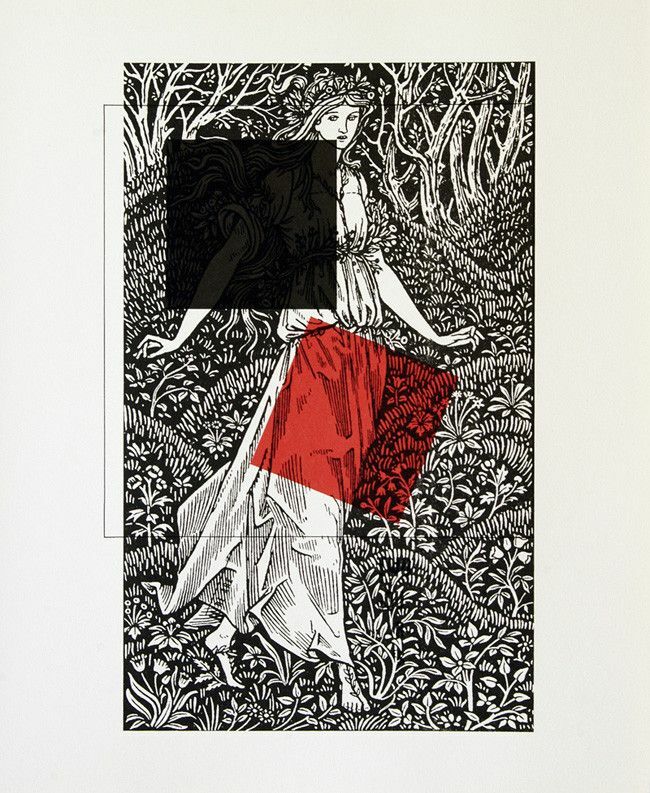 In the first part, pages from a facsimile edition of William Morris’ Kelmscott edition of his late romance The Wood Beyond the World, has been overlaid with enlarged recreations of pages from Russian artist El Lissitzky’s acclaimed book About Two Squares. 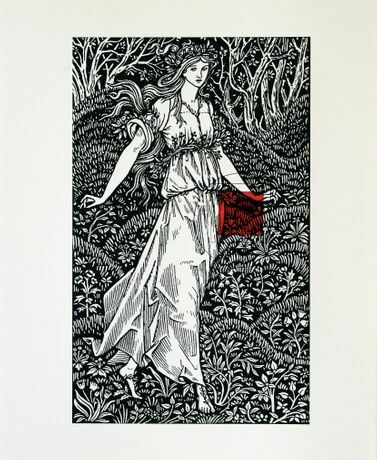 In contrast, in the second part, Mabb has also overlaid Edward Burne Jones’ illustration of the Maid from The Wood Beyond the World onto a facsimile edition of About Two Squares. Morris and Lissitzky both used their art to promote their socialist politics. Yet, whilst Morris saw beauty in the past, wanting to elevate Victorian society from the ugliness imposed by industrial manufacturing, for Lissitzky, the Russian revolution and the rapid advancement of science and technology meant the old world was no longer recognisable. He sought an entirely new visual language that could express the socialist world he believed he was helping to construct. 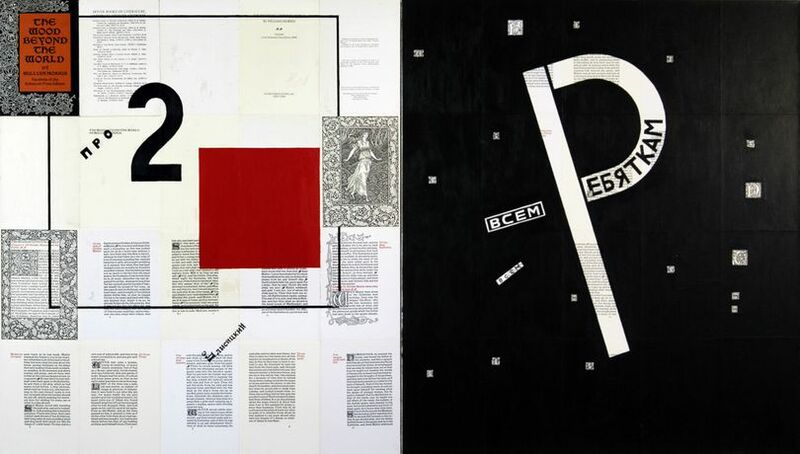 Mabb draws our attention to the different directions of Morris and Lissitzky’s influences. Although on the surface they become collaborators, their designs remain distinct, never able to fully merge or separate. 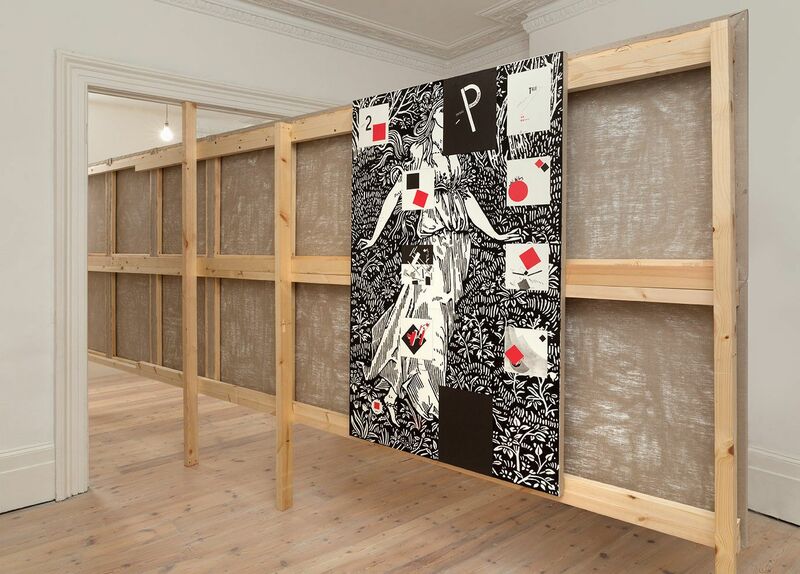 David Mabb works with appropriated imagery to rethink the political implications of different aesthetic forms in modern art and design history. 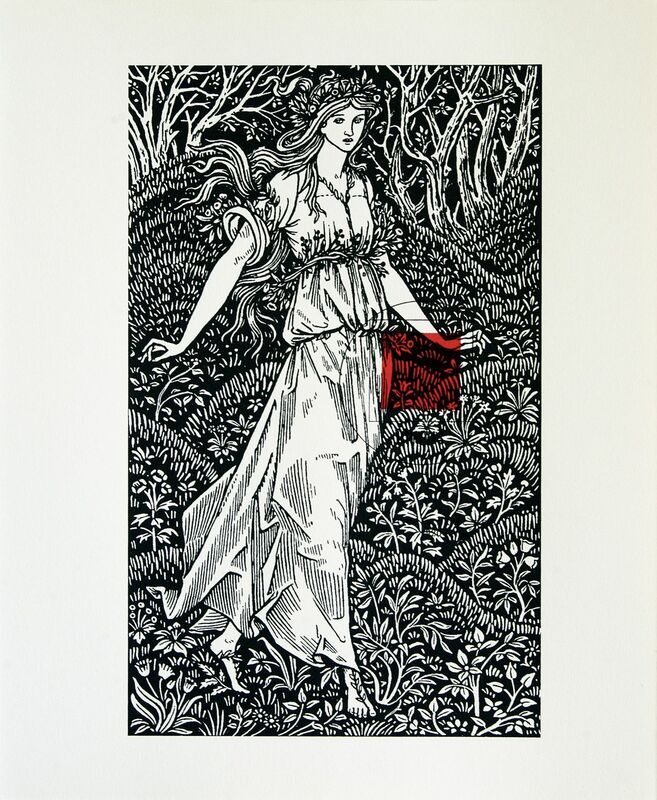 Recent work has focussed on the designs of 19th Century English interior designer, writer and socialist William Morris. Mabb’s interest in Morris stems from the social and political connotations of Morris’ work, the continued relevancy of Morris’ politics and the continuing market for Morris’ designs. Mabb’s interpretations or reconfigurations of Morris’ designs consider the relationship between Morris’ own thinking and other forms of cultural production. Recent solo exhibitions include the William Morris Gallery, London (2015); Focal Point Gallery, Southend on Sea (2014); Delaware Centre for the Contemporary Arts, Wilmington (2010); Contemporary Art Centre, Vilnius (2006); Art Gallery of Windsor, Ontario (2003) and Oakville Galleries, Ontario (2000). He curated Utopia Ltd. (with Mary-Ruth Walsh) at Wexford Art Centre and the Highlanes Gallery, Drogheda, Ireland (2011) and William Morris “Ministering to the Swinish Luxury of the Rich” at the Whitworth Art Gallery, Manchester (2004). Mabb is Reader in Art and Programme Leader MFA Fine Art (studio practice) at Goldsmiths, University of London. 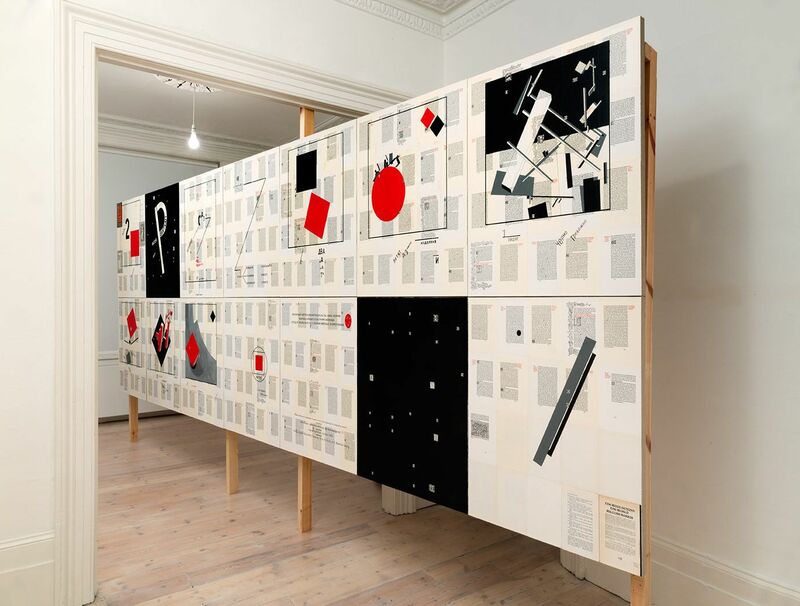 To coincide with the exhibition, David Mabb has produced for our multiple market 11 prints, each of which will be presented within Lissitzky’s book About Two Squares, published by the Tate Gallery in 2014. David Mabb would like to thank Goldsmiths, Department of Art, Research Support Award for help with this project.